Specialized medical equipment designed for in-home use enables disabled or ill patients to receive excellent care and experience better outcomes while enjoying higher quality of life. 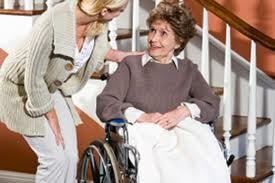 Proper equipment enhances caregiver safety as well as patient comfort at all points throughout the care continuum. The equipment most commonly required for home care includes mobility devices, such as wheelchairs and walkers; access equipment; oxygen therapy equipment; bathroom safety equipment; monitors; and assistive furniture. Mobility devices range from simple canes to sophisticated motorized wheelchairs and scooters. Specialized wheelchairs are available for transport or extended use, and for sports. Walking aids may include simple and stabilized canes, crutches, braces, walkers and rollators. Access equipment such as ramps or stair lifts may be required for patients who are wheelchair-bound or cannot climb steps. Crane-operated lifts and slings enable caregivers to lift patients and transfer them safely and comfortably between bed, wheelchair and chair. Oxygen therapy equipment provides supplemental oxygen that can significantly extend the lives of patients with chronic obstructive pulmonary disease and cardiac disease. Most patients use cylinders of compressed oxygen or an electrically powered oxygen concentrator to provide oxygen on a continuous or as-needed basis. The oxygen is delivered via a nasal cannula or face mask. Bathrooms are widely recognized as the most dangerous room in any house. Grab bars, shower and bath benches, bathtub rails, commodes, raised toilet seats and hand-held shower sprayers are among the most essential home health care items for ensuring patient safety and maximizing autonomy. A wide range of personal devices and monitors enable patients and their caregivers to monitor vital measures and provide essential data for adjusting medication and treatments. Commonly used monitors include glucose monitors, blood coagulation meters, apnea monitors, pulse oximeters, peak flow monitors, blood pressure monitors, spirometers, pedometers and scales. Personal devices used in home health care settings include nebulizers and breast pumps. In recent years, remote monitoring devices have been introduced for tracking patient signs via traditional or wireless telephony. Assistive furniture includes hospital beds, mattresses, over-bed tables and standing supports that maximize patient comfort and safety. Lift chairs enable patients to rise from a sitting position without a caregiver’s assistance. Medical equipment play an important role now these days in our life. Thanks for sharing the nice post. Its important not only for safety but also to give the disabled a sense of independence. Many disabled people suffer from depression since they have to rely on others for help. Its sad but glad there are many options available now. The equipment mentioned will not only help the caregivers with their work, but it will also help the patient be more comfortable as they move around.